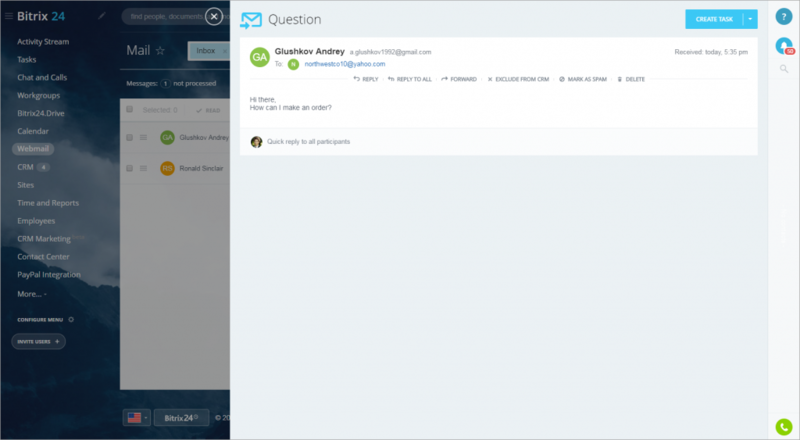 As you may have noticed, we've entirely revamped our webmail client. You can now easily connect any email address (or several, if you are a commercial Bitrix24 user) to your Bitrix24 account, work with your emails inside Bitrix24 much like you do with other popular webmail services. But unlike Gmail, Yahoo!Mail or iCloud and email inside Bitrix24 is easily added to CRM, activity stream, chat or calendar event. Pretty impressive, isn't it? P.S. Shared inboxes with customizable processing rules are now available as well inside Bitrix24 Contact Center.